The temple complex at Karnak is known above all for the Great Temple of Amun, the most important temple in Egypt from the 18th Dynasty onward. Within the Precinct of Amun (central enclosure) lies the Great Temple itself, and subsidiary temples to other deities. A separate enclosure to the north of Amun is dedicated to Montu, the local god of Thebes. 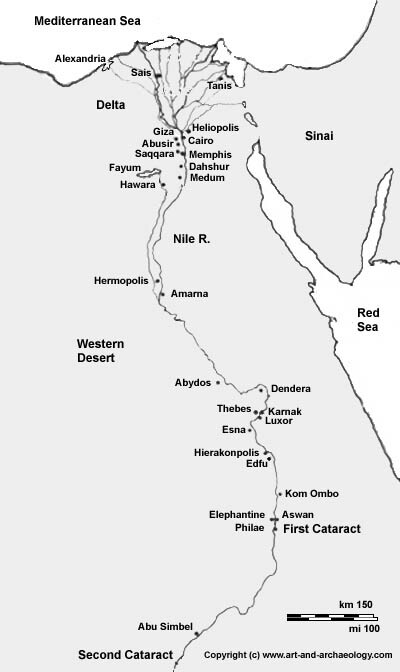 To the south of Amun lies the Precinct of Mut. 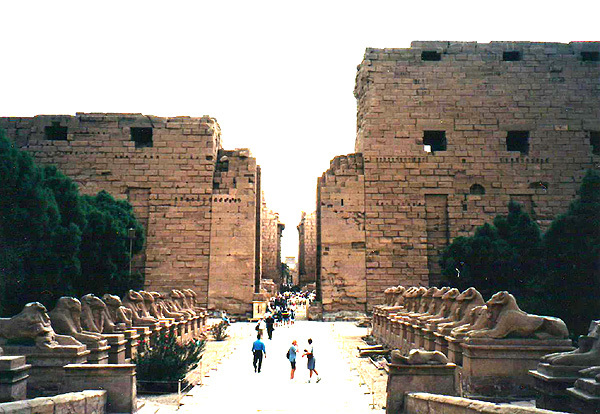 The major W-E axis (Processional Way) of Karnak is shown here. It is lined by ram-headed sphinxes (criosphinxes), begins at Pylon I, and leads eventually to the holy of holies, the enclosure of Amun. Earlier pylons (II, III, etc) can be seen further down the avenue, leading east to the sanctuary of the Great Temple. Karnak was successively enlarged over the centuries; the innermost structures are the earliest, and the outermost structures are the latest. Pylon I may have been built as late as the 30th Dynasty (380-343 BC). If you are following this photo tour with a map, the basic sequence of photos is west to east until the center of the temple, then south to the sacred lake, then retracing our path back to the first pylon and out the way we came.